Over the last few years, our society’s consumption of video content has never been higher. YouTube users alone watch 46,000 years of videos on an annual basis. Now, video is extending beyond the domain of humans. More and more machines are watching video and are interpreting the data they “see” to drive business decisions by using industrial edge applications. Emerging technologies that enable integrated video analytics (IVA) are impacting a broad set of applications across a wide variety of environments including buildings, hospitals, vehicles, and factories. 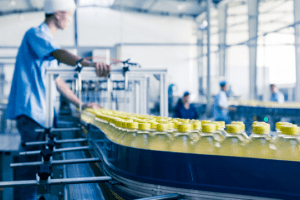 In the case of manufacturing, video analytics applications are helping to increase throughput, reduce energy consumption, and improve overall product quality. The great enablers of these kinds of benefits, high definition video cameras, are providing information in such detail that real time decision-making is significantly enhanced. Examples abound of how IVA is impacting people’s lives. The U.S. Department of Homeland Security uses multiple high definition cameras to perform facial recognition in airport security lines. High definition cameras capture images of the people who pass through from multiple angles. The cameras are strategically placed so that an image of a person’s face can be quickly assembled. That captured data is then compared to the facial data of persons of interest, and emergency security measures are then taken if required. Similar security technologies are also deployed in public places like stadiums and museums. Such technologies improve safety and security by weeding out threats without inconveniencing the vast number of people who are simply there to enjoy the event. These types of edge applications are data intensive and, as such, the large quantity of data involved cannot be economically sent long distances to a cloud data center. By processing locally with the aid of solutions such as micro data centers, integrated video analytics applications are more affordable and faster (cloud-related latency issues are avoided). Integrated video analytics are also being utilized more extensively in retail environments. High end fashion stores, for example, have cameras that recognize platinum customers when they walk through the door. The images are analyzed and produce customer profiles that a salesperson can instantly access. The system reviews the buyer’s history and makes recommendations for how the salesperson can enrich the customer’s shopping experience. As a result, the level of customer satisfaction increases and the store develops a competitive advantage, as the ability to recognize customers when they walk into the store becomes a differentiator. Some of the new Amazon Go retail outlets are piloting integrated video analytics systems that place hundreds of cameras in the ceiling. When a customer walks in, video analytics systems sense who the customer is through indicators on their cell phone. As the customer walks through the store and picks up preferred items, the video cameras capture what is being placed into the shopping basket and the customer is simultaneously charged. The customer leaves the store without having to stand in any checkout line. Manufacturing sites are also beginning to deploy video analytics system technologies. In the Food and Beverage industry, for example, the amount of food wasted due to processing defects, breakage, or contamination has always been a cost driver. Now, food items, such as potato chips, are filmed by high definition cameras as they make their way down the conveyor belt production line. The images reveal whether the potato chips are too dark (overcooked) or too salty. The system then sends instructions upstream to where the ingredients are being prepared or to the ovens and heaters so that proper adjustments can be made. Algorithms process video-based data, which drive adjustments to the automation of the manufacturing process, thus limiting waste and boosting output efficiency. As new technologies such as video analytics begin to proliferate, businesses across the globe have the opportunity to improve their product safety and quality thereby driving higher levels of customer satisfaction. Core infrastructures such as micro data centers help to drive the local processing needed to capture the data that generates better decisions. In many cases, integrated video analytics applications are supported by local processing supported through micro data centers. The software supporting such applications drives hardware requirements that then feed the specifications for the micro data center. IT server processing power and storage ideally should be bundled with power, cooling, rack, UPS, and monitoring solutions so that the integrated video analytics applications can run in a reliable, predictable, and safe manner. Learn more about how Schneider Electric solutions such as micro data centers can help to innovate your business.